According to a report by UK Daily Mail, visitors from 'high risk' countries in Africa and Asia will have to put up a £3,000 cash bond to enter Britain. The money will be kept by the Government if visitors do not return home by the time their visas expire. 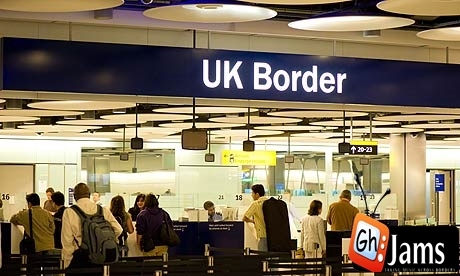 A pilot scheme, introduced by Home Secretary Theresa May, will target hundreds of people coming to Britain on six-month visit visas from India, Pakistan, Nigeria, Ghana, Sri Lanka and Bangladesh. The countries have been picked for their high number of visa applications and what the Government sees as relatively high levels of immigration abuse and fraud, reports the Sunday Times. The bonds, to be introduced from November, will only apply to non-EU migrants, otherwise they would fall foul of European rights to free movement. 'This is the next step in making sure our immigration system is more selective, bringing down net migration from the hundreds of thousands to the tens of thousands while still welcoming the brightest and the best to Britain,' Mrs May told The Sunday Times. A second scheme will cover countries such as Kenya, the newspaper reports, which are considered to be lower-risk because immigration officials have fewer doubts about migrants' plans to return home. About 2.2million people are granted visas to enter Britain every year. Last year 296,000 people from India were granted six-month visas, as were 101,000 from Nigeria, 53,000 from Pakistan and 14,000 apiece from Bangladesh and Sri Lanka. The Home Secretary plans to reduce annual net migration to under 100,000 by 2015.